Tired of lists that contain nearly every car seat on the market? They don’t help you at all to narrow down your choices! Here are my Quick Picks of favorite recommended car seats, limited to just one or two models in each price point per category. I have extensive hands-on experience with every model on this list and would not hesitate to use any one of them if it was for my own child! In many cases, manufacturers make nearly identical seats with different names or slightly different features. These are also highly recommended, but not included for simplicity. There are many other excellent car seats on the market. The purpose of this short list is to help parents narrow down all the options, rather than to list all the dozens of models I would personally recommend. Made in conjunction with the experts at CarseatBlog. 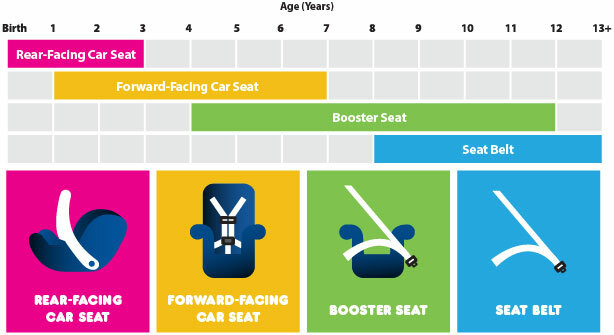 Please also see a more complete list of Recommended Carseats at CarseatBlog with more information on each model. Please note that SafeDad, CarseatBlog and Carseat Media LLC DO NOT conduct any testing on car seats. The safest model is one that fits your child, fits your vehicle and is easy for you to use each and every trip. This list will help you find those that tend to work well for many parents. There may be incompatibilities, so please make sure you have a good return policy just in case you don’t like it for any reason! Image courtesy NHTSA. SafeDad makes no representations as to accuracy, completeness, currentness, suitability, or validity of any information on this site and will not be liable for any errors, omissions, or delays in this information or any losses, injuries, or damages arising from its display or use. All information is provided on an as-is basis.